The hunting of wild animals is an emotive issue, drawing fire from anti-hunting organisations, environmentalists as well as many ordinary citizens. But it also has its supporters, some of whom argue that hunting, in particular, is a valuable source of income and that it contributes to conservation of wildlife, that can be used to protect threatened species and be put to other good uses. Africa remains one of the most sought after destinations for hunters. The North West University’s Tourism Research in Economic, Environs and Society unit, which I’m a part of, set out to establish what financial contribution hunting makes. This is a particularly important question given the poverty challenges facing the country. From our research, conducted in South Africa, we established that hunting contributes immensely to economic development. We looked at two main groups of hunters: international hunters, also referred to as the trophy hunters almost all of whom are foreigners, and local hunters, known locally as the biltong hunters who hunt for meat (Biltong is a local dried meat similar to jerky). The research found that hunters (consumptive wildlife tourist) spend double and more the amount than non-consumptive wildlife tourists. Non-consumptive wildlife tourism refers to bird watching, game viewing (safari’s) and trails, to name a few. By our calculations trophy and biltong hunters contribute a combined R13.6 billion ($909 million) to the South African economy in 2016/2017 season. This is only the direct contribution. If one would like to determine the economic impact of hunting one also needs to determine the indirect and induced impact. We are still in the process of publishing this data. An estimated 7600 trophy hunters visited South Africa in 2016. Their trips lasted, on average, 12 days, and on average they spent R262 000 (US$20 000) per trip. Based on these numbers we calculated that trophy hunting contributed close to R2 billion ($130 880 815.00) to the South African economy. Our calculations also show that between 70% and 80% of trophy hunters’ spending takes place in the area of the hunt. This includes the accommodation, game hunted and in some cases also the trophy handling and processing. For their part, biltong hunters spent on average R58 000 ($4 000) per season. When multiplied with the number of frequent biltong hunters in South Africa (200 000), it totals R11.66 billion. What makes the spending of hunters so important is that hunting mainly occurs in rural areas, which are in dire need of job creation and economic development. In addition, hunting creates jobs, particularly in rural areas where employment is most needed. Research conducted in three of the top hunting provinces – the Northern Cape, Free State and Limpopo provinces – showed hunting created 31 500 jobs in the three provinces – 17 806 in Limpopo, 9 072 in the Northern Cape and 4 558 in the Free State. Typical employment created directly includes guides, professional hunters, skinners, trackers, catering, housekeeping, maintenance, conservation management, anti-poaching and taxidermy, to name a few. Most of the land used for hunting in South Africa was originally farmland used for crops, cattle and other farming activities. To transform the land for hunting purposes required spending on new infrastructure, including for example accommodation, staff accommodation, cooling rooms, slaughtering facilities and meat processing facilities. Recent research conducted from one of my PhD students found that the average spend by product owners on infrastructure is just over R7 million (US$ 490 000), with some even spending up to R30 million (US$ 2.1 million). This all adds up to infrastructure development in rural areas. This again created an economic stimulus in these rural areas. There is more wildlife in South Africa than there was 50 or 60 years ago. There are now estimated 19 million head of game in the country compared to the 1950 when there were less than half a million individuals left. The reason for this is that there is more land under conservation in South Africa today than in the 1950s or 1960s, mainly driven by hunting which gave wildlife an economic value. It’s estimated that the private wildlife industry is managing an estimate 20 million hectares, compared to the +-6 million hectares owned by the state (national parks, provincial parks and others state-owned conservation areas). These private reserves rely heavily on hunting to keep their businesses going and hunters need game to hunt. Therefore private reserve owners often need to breed game for this purpose. One consequence is that species such as the tsessebe, roan antelope, sable, bontebok and rhino have been saved from extinction as private wildlife reserve owners bread with these species, as it has financial gain for them. Hunting, therefore, remains very relevant to South Africa, and southern Africa. 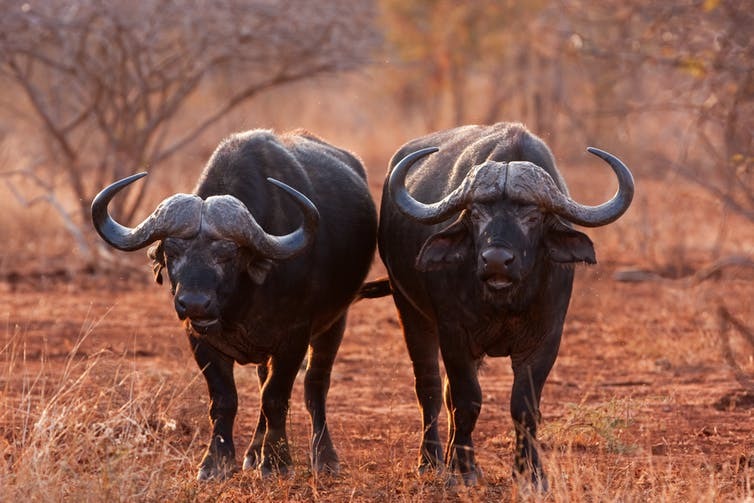 Header image: Buffalo in the Kruger National Park, South Africa. Credit: Shutterstock.